Thread: Butcher in Auckland to make Veni sausages? Depends how far you want to go but I know the butcher at greenwoods corner will do them. The meat just needs to have no grass or hair etc on it. I.e. Nicely field dressed and prepped health regs etc.... A mate had a butcher in puke that you could just drop off the whole field dressed carcass and they'd break it down & do your sausages etc... If you want I can't enquire on that one also. Thanks for that, I think I recall a mate using the guy at Greenwoods Cnr years ago. Any idea of his name or how to go about it? Yeah it's all dressed very tidily, I'm a meat exporter by trade so fairly picky about breaking down the carcass as you might imagine. I can recommend Counties Custom Killing at Bombay. They will process your animal provided it has been gutted and the head removed. They prefer the legs lift on to make skinning easier. Or they will take it fully field dressed. One big advantage is that if you shoot something on the weekend, give them a call on their mobile and you can drop the animal off in their outdoor holding chiller, turn the chiller on and they will come down later in the evening and transfer it to the indoor chiller. They do a very nice salami as well. sako75, Kscott, Carpe Diem and 1 others like this. The butcher in Hellensville did a bunch for me and they were the best salamis and sausages I've ever had. Highly recommended. I normally go to the Hellensville one but looking for something more closer to East Tamaki area. Anyone know of a butcher they can recommend. Off cuts are obviously bone free and tidy. Country Meat Processors in Kaukapakapa - give Nadia or Steve a call (09) 420 3113. Cant speak highly enough about the service and quality. Coming from West Auckland. Best salami and sausages I have had and have tried a few butchers now. He is reasonably priced from memory $4:50 kilo of sausages and $10 a stick of salami. Cheers guys. I'm gonna give Greenwoods a go but will look into those others if no good. Basecamp salamis do an awesome product. They have a pretty reasonable courier service too. $40 return nationwide. 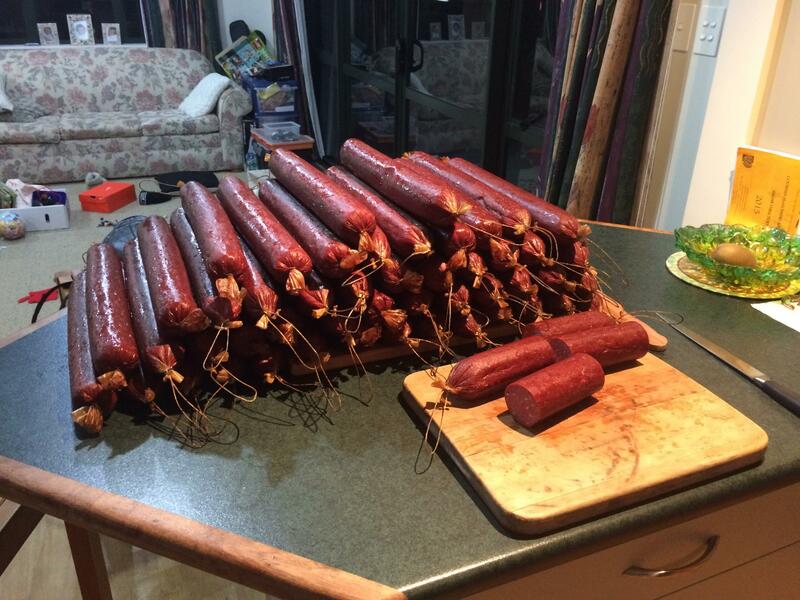 Here's a photo of the last batch of salami I got from Counties Custom Killing. Wild duck, wild turkey, wild goat and wild venison mix. Bet your house smelt nice.